Greta Van Fleet leads the rock community with four nominations for the 61st Grammy Awards next February. The Michigan outfit are among the finalists for Best New Artist, Best Rock Album, Best Rock Performance and Best Rock Song. 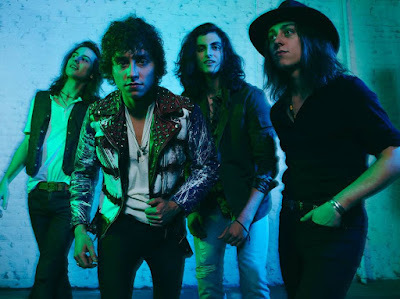 In the Best New Artist category, Greta Van Fleet are named alongside seven other acts, including Chloe X Halle, Luke Combs, H.E.R., Dua Lipa, Margo Price, Bebe Rexha and Jorja Smith. The group’s 2017 EP, “From The Fires”, will compete for Best Rock Album against projects by Alice In Chains (“Rainier Fog”), Fall Out Boy (“Mania”), Ghost (“Prequelle”) and Weezer (“Pacific Daydream”). In the Best Rock Performance category, Greta Van Fleet’s debut single, “Highway Tune” – from the 2017 EP “Black Smoke Rising” – will go head-to-head against tracks by Arctic Monkeys (“Four Out Of Five”), Chris Cornell (“When Bad Does Good”), The Fever 33 (“Made An America”), and Halestorm (“Uncomfortable”). The “Black Smoke Rising” title track is one of five tunes in the running for the songwriter’s award, Best Rock Song, where it is finalist alongside music released by Twenty One Pilots (“Jumpsuit”), Bring Me The Horizon (“Mantra”), St. Vincent (“Masseduction”) and Ghost (“Rats”). Currently on the road across North America in support of their 2018 album debut, “Anthem Of The Peaceful Army” – which debuted at No. 5 on the US Billboard 200 this fall – the band will play three shows at Detroit’s Fox Theatre later this month, where they will celebrate their industry recognition with the Children’s Hospital Of Michigan.